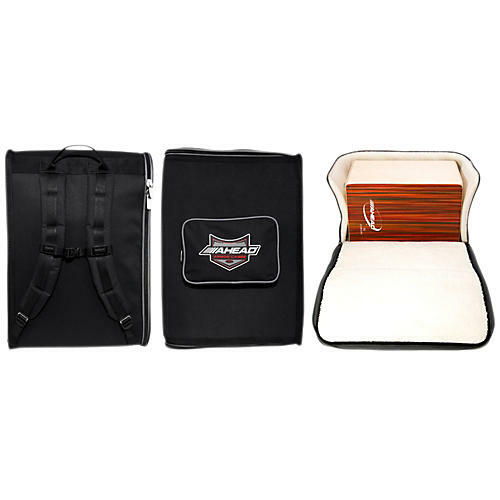 A cajon case with a fleece-lined interior, weatherproof exterior and backpack straps. Ahead's Deluxe Cajon Case features a soft, thick sherpa-lined interior to ensure safe travel, while the weatherproof exterior protects your instrument. The most unique feature of the case is its zipper design - when fully opened, two sides of the cajon are exposed. Many other cases only open one side, causing you to awkwardly dig your cajon out. With this design, your instrument is effortlessly removed. A small accessories pocket is included on the side to hold a metronome or some drum keys, as well as a carrying strap and a shoulder strap. The case's dimensions measure 21" x 15" x 15".